A frantic and amazing drum intro leads us in to this upbeat party song. Alright, you got me, Please Drive Faster is not a party song. But you can't help tapping your toe to the intricate rhythmic changes and singing along with the classic line "Please drive faster.... Oh no! Disaster!" This version is a bit different than other versions I've heard (or else the amazingness of vinyl is playing games with me). There are some extra heavily distorted backing vocal parts that are pretty unnecessary, for example. I never noticed it before, but there's also a really interesting dissonant note lying under the last couple strums of the song. This must be the part that makes this band earn their math rock classification at times. Or maybe just that they're not singing standard pop songs. 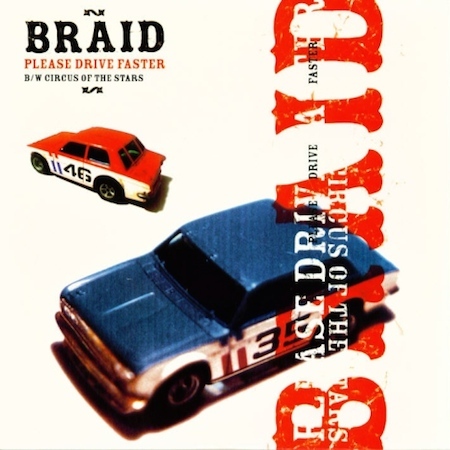 The B-side has it's moments, but the other singer in Braid is a bit too Get Up Kids for the old version of myself. There's a really great part where the two singers sing different parts that overlap each other. That's always been one of my favorite songwriting tricks and keeps me interested in this song. It's not my favorite Braid song, however. Overall, this is a decent sample of the intricacy of Braid and the great variation they bring to their recordings. Of course, buying these this late in the game just reminds me of all the things I probably missed while I was focused on my pop-punk youth. I probably should have listened to more Braid.